I recently stumbled upon a reference to Molly Pitcher, a woman from Pennsylvania who fought with her husband during the Revolutionary War for a New Jersey militia unit, and whom New Jersey has adopted as their own heroine of the war, lifting her to almost cult status. Who was this legendary woman? Was she a real woman who fought in the war? In Emily J. Teipe’s 1999 article “Will the Real Molly Pitcher Please Stand Up?” in Prologue Magazine, she cites Robert Leckie’s text, which states that Molly Pitcher was actually Mary Ludwig Hayes, a daughter of German immigrants, who fought alongside her husband, John Hayes, in Captain Francis Proctor’s company in the Pennsylvania Artillery. She was described as a “twenty-two-year-old illiterate pregnant woman who smoked and chewed tobacco and swore as well as any of the male soldiers.” Mary Ludwig Hayes has an official Revolutionary War record, participated in the Battle of Monmouth, supplied exhausted soldiers with drinking water (earning the name “Molly Pitcher”), reportedly received thanks directly from General George Washington, and collected an annual pension of forty dollars from the State of Pennsylvania for her military actions. Mary Ludwig Hayes seems like an excellent candidate to be the real Molly Pitcher, and Teipe’s research proves that women certainly did perform outstanding duties in battle during the Revolutionary War. Many additional texts, including William Henry Egle’s Some Pennsylvania Women During the War of the Revolution, state that a woman named Margaret (Cochran) Corbin, daughter of Robert Cochran and wife of John Corbin, enlisted in Captain Francis Proctor’s company in the Pennsylvania Artillery along with her husband. Margaret Corbin was officially recognized by the Board of War, and received disability pay for her services, much the same as Mary Ludwig Hayes. 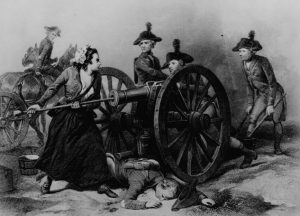 Thanks to Teipe’s previous research, along with additional texts, it seems that “Molly Pitcher” may have been a mythic concoction of multiple heroic women who officially served during the Revolutionary War. There are few examples of women actually receiving state and federal pensions, but it is widely known that a considerable number of women gave wounded soldiers care, food, and water at their homes during the war. There may have been countless others who fought in the Revolutionary War about whom we don’t yet know. George Washington’s War: The Saga of the American Revolution (New York: Harper Collins, 1992), 486. Emily J. Teipe, “Will the Real Molly Pitcher Please Stand Up?” Prologue Magazine 31: 2 , as seen on the National Archives Website, http://www.archives.gov/publications/prologue/1999/summer/pitcher.html#f1. See also the illustration above. ARC Identifier: 532935; The George Washington Bicentennial Commission, 1931–1932; Records of Commissions of the Legislative Branch, 1928–2006; Record Group 148; National Archives and Records Administration, as viewed on the National Archives Website, http://www.archives.gov/global-pages/larger-image.html?i=/publications/prologue/1999/summer/images/rev-war-molly-pitcher-l.jpg&c=/publications/prologue/1999/summer/images/rev-war-molly-pitcher.caption.html. William Henry Egle, M.D., Some Pennsylvania Women During the War of the Revolution (Harrisburg, Pa: Harrisburg Publishing Company, 1898), 52. Teipe, “Will the Real Molly Pitcher Please Stand Up?” Prologue Magazine 31: 2 . Andrew, you may not be aware that each year at our annual Continental Congress the National Society Daughters of the American Revolution give the Margaret Cochran Corbin Award for Distinguished Women in Military Service to a woman currently serving in the U.S. military. This customarily occurs on the last night of Congress, National Defense Night. I tried to upload a photo of the Molly Pitcher memorial at the Old Cemetery in Carlisle PA, but was unable. It is right by Mary Ludwig Haye’s grave. As a member of the Cumberland County Chapter, NSDAR, Mary is very special to us. We have members of our Chapter whose lineage traces back to Mary. The actual Molly Pitcher could not have been a woman in disguise. Joseph Plum Martin identifies her as wearing a dress and petticoat at the battle while placing a cartridge in the muzzle of a cannon.